The benefit of crowd-funding platforms, like Indiegogo campaigns, is that they provide up-front funding so that small, independent creators can avoid heavy debt loads and reliance on funding avenues that may dry up in the future. Third Person Press’s mission is to find, nurture, publish, promote and pay regional writers of speculative fiction. We think we’re filling a niche in a way that lets new and established voices share their stories with a wider audience. 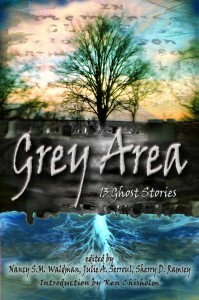 The Grey Area campaign includes perks such as laminated bookmarks, spooky post cards (“ghost cards”), print and/or ebook copies of Grey Area and the other titles from Third Person Press, limited-edition handmade jewelry, and original artwork. Special rewards for writers include online writing courses, editing services, and cover art. All perks are transferable; supporters can double their good karma by donating and giving the perks to someone else as a gift. Everyone will receive an acknowledgement of thanks with their name listed on the Third Person Press website and Facebook page as well as having the satisfaction of having encouraged and literally supported regional SFF writers.